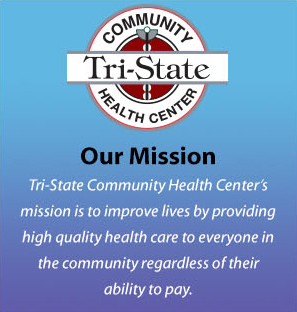 Non-narcotic approach to pain control: Tri-State Community Health Center medical providers use a non-narcotic approach to pain management. Our approach to pain management may include the use of non-narcotic pain medications, physical therapy modalities, aquatherapy, antidepressants, anti-seizure medications, chiropractic referral, or acupuncture referral. Our medical providers will tell patients at their first pain-related appointment if an exception to this policy will be made. A Tri-State Community Health Center medical provider may, solely at their discretion, choose to use another approach, including the use of narcotics, with patients with whom he or she has established a long-term (over 2 years) medical relationship and bond of trust. Pain not controlled by the above methods or pain management that requires use of narcotic medication beyond a period of one month will be referred to appropriate specialists. Controlled substance agreement: any patient given a controlled substance on an ongoing basis will be required to sign a controlled substance agreement. Any divergence from this agreement is grounds for discontinuation of the medication. Medication refills are made during regular office hours only. No refills will be made by the on-call medical provider. No controlled substances will be prescribed to new patients who do not provide copies of previous medical records that clearly indicate the reason the medications were prescribed in the past.